Every day FOUR women in Australia die from a gynaecological cancer. While survival rates across all cancers have improved by 19 percent over the past 25 years, the relative survival for all gynaecological cancers has improved by only seven percent. The Australia New Zealand Gynaecological Oncology Group (ANZGOG), the peak national research group, says it's time to change this statistic. September is International Gynaecological Cancer Awareness Month and ANZGOG are urging all Australians to get involved to help raise funds for critical research. Simply register at www.savethebox.org.au and ANZGOG will send a Save the Box fundraising kit. All you have to do is organise a brunch, create your own event or just make a donation. $1500 helps put a woman on a clinical trial. 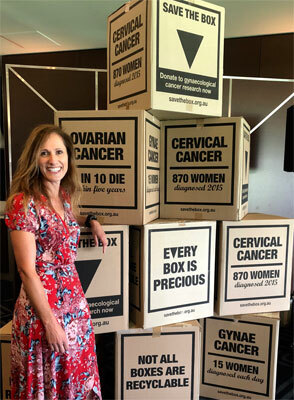 ANZGOG Chair, Associate Professor Philip Beale, says, "Save the Box aims to lift the taboo around these cancers and raise much needed funds for research. Donations made will go towards significant new research projects. Clinical trials are key to improving the lives and wellbeing of women who have a gynaecological cancer. Last year, the money raised from the campaign helped foster new research projects, including the EMBRACE sub-study, designed to improve our understanding of sensitivity and resistance to PARP inhibitors in women with high-grade serous ovarian cancer. The team working on this study have led ground-breaking translational research in this field. "Research is the key to improving the lives of women with a gynaecological cancer. Virtually every advance in cancer has been made on the back of clinical trials," states Assoc. Prof. Beale. Approximately 19 women in Australia (16) and New Zealand (3) are diagnosed with gynaecological cancer every day. Endometrial cancer is the most common gynaecological cancer in Australia and New Zealand. At present, there are more than 18,469 women living with gynaecological cancer, with a further 6,073 women estimated to be diagnosed this year. There are seven gynaecological cancers - ovarian, uterine (endometrial), vulvar, vaginal, cervical and two rare pregnancy cancers. Ovarian cancer is associated with the poorest outcomes. There are no screening tests for gynaecological cancers except for cervical cancer. ANZGOG encourages women to know their bodies, understand the symptoms for gynaecological cancers and take control of their health and visit a doctor if anything is out of the ordinary. "Many people feel uncomfortable speaking about women's gynaecological health. 'Save the Box' asks you to think about the preciousness of a woman's life. Each day, mothers, sisters, daughters and friends are diagnosed with, or die from gynaecological cancers. We need everyone's support to find new treatments for women," concludes Assoc Prof. Beale. Question: Can you share your story of ovarian cancer? Heather Hawkins: 11 years ago, February 2007, I was a busy working mum with two children, life was perfectly normal, in the full and busy way it can be. My husband Doug and I had our own film and video production company and we were doing our best to balance work and family life. I began to notice some physical changes: Increasing abdominal bloating and discomfort, heavier periods, found I was racing to the bathroom to urinate a lot more frequently and battling a growing fatigue. At first I put it down to middle age spread and to my lifestyle… I wasn't exercising at all. But one morning when I could fit into my favourite red skirt, and I felt firmness in my lower right abdomen, alarm bells began to ring. I made an appointment with my family doctor, who sent me straight off to have a CT scan. That afternoon my husband and I returned to his rooms to receive the results. Nothing could have prepared us for what we were about to hear… the devastating diagnosis of ovarian cancer. I remember sitting in stunned silence, quietly battling to keep it together… then all my questions came flooding out. "Would I survive this? What kind of surgery and treatment would I need? What about our children? Where to from here?" The next week I underwent extensive surgery - involving a hysterectomy, the removal of my ovaries and fallopian tubes along with the 18cm ovarian tumour. I woke up in the hospital recovery ward with an incredible sense of relief, the tumour had gone, and a few days later pathology showed that it had been found at Stage 1 and had not spread. I was so incredibly fortunate. In a handful of days I was home, moving slowly and cradling my healing abdomen. My family and friends looked after me, and soon I was back driving the kids to school, working from home, determined to push back at being defined by cancer and wanting to make some changes to my life. Question: How did Ovarian Cancer inspire your love of adventure? Heather Hawkins: 'A shifting compass' and 'life is so incredibly precious' were phrases that began creeping into my daily conversations. I knew that I needed to become fitter, healthier, more prepared to embrace opportunities, and be a whole lot bolder. So in 2012 I pulled on an old pair of runners and gardening shorts and trained for the 4km Mother's Day Classic race with my 2 kids. Little did I know this race would become a turning point in my life - because I discovered I actually loved long distance running. From there, over the next few years, I challenged myself to take on half marathons, marathons and ultra marathons - training hard and always aiming to run that little bit further with each one - and always with the purpose of raising funds and awareness about gynaecological cancers. Then on a whim I signed up for the 2015 North Pole Marathon. I trained in the soft sand at Coogee beach over the summer months and as race day inched closer I bought thermals, ski goggles and trail runners for the Arctic conditions. This race was the toughest physical challenge I'd ever encountered, with temperatures plummeting to -41c, wild winds and running through deep sections of snow and slippery ice. After 6hrs & 57 mins I crossed the finish line in first place female. It was a huge surprise and another profound, life defining moment for me… Here I was, a 50 year old Aussie mum, a cancer survivor who'd only been running for 3 years, overcoming this gruelling physical challenge. Question: What adventure is next, for you? 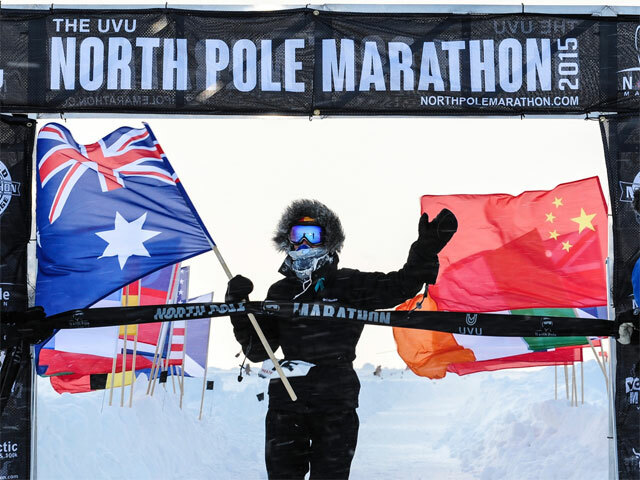 Heather Hawkins: Next I'll be lacing up my trekking boots and climbing Mt Kilimanjaro in February 2019, then I'm looking to sign up for another extreme ultra marathon - perhaps running 250 kms in Iceland? Question: What is the Save the Box initiative? 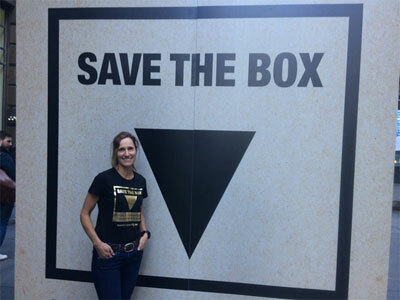 Heather Hawkins: Save the Box is a fantastic campaign designed to raise awareness and funds for research into gynaecological cancers. It's hoping to encourage us all to start a conversation about our 'women's bits' as this shouldn't be a taboo or embarrassing topic. The campaign website www.savethebox.org.au also provides clear information on the signs and symptoms of gynaecological cancers, so we can become really well informed. And there are things that we can do. Throughout the month of September share the message on social media. Fundraise - Simply register and the team will send you a Save the Box fundraising kit. Then all you have to do is organise a brunch, create your own event or just make a donation. Don't be shy, ask your family, friends, community and work colleagues to sponsor you, and when you raise over $100 you'll be sent a limited edition 'more precious than gold t-shirt'. These are truly awesome t-shirts! Question: How will you be participating in the Save the Box initiative? Heather Hawkins: It's been a privilege to already take part on the panel at the recent campaign launch and also have a chat on Sky News. Now I'm planning an early morning fundraising brunch with friends and I'll continue to share the message on social media… The more opportunities we can create, the better. I'll also be wearing my fabulous 'more precious than gold t-shirt'. Question: What message do you hope to spread for International Gynaecological Cancer Awareness Month? So that in the future when a woman sits in her doctor's rooms and receives the diagnosis of gynaecological cancer, she will have a much, much better chance of survival. So go ahead, let's 'save the box' and save women's lives.